Enhance your computing performance with the Apple MacBook MB403LL/A notebook PC that is powered by a 2.6 GHz Intel Core 2 Duo processor. The glossy widescreen display of this Apple 13.3-inch laptop gives you a clear and bright view of all the content in your PC. For a superior graphic performance, this notebook PC comes integrated with the Intel Graphics Media Accelerator X3100 with 144 MB memory of DDR2 SDRAM. The iSight camera of this Apple 13.3-inch laptop enables you to video chat with your friends, with ease. You can access the internet anywhere you want with the Apple MacBook MB403LL/A AirPort Extreme Wi-Fi connectivity. 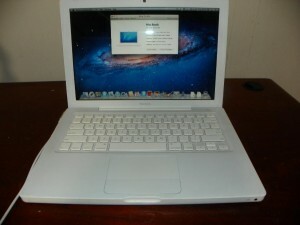 Apple macbook white is pre-owned and fully tested to be in great working and cosmetic condition. Screen face has only a few very faint marks in tint, does NOT show during use! Palmrest is good shape, NO cracks or chips, and still nicely white. Lid and bottom case have only faint signs of use, few very thin lines forming, looks very good overall! Battery is in great shape and holds very good charge. Overall Macbook is in great shape with only a few faint cosmetic imperfections.